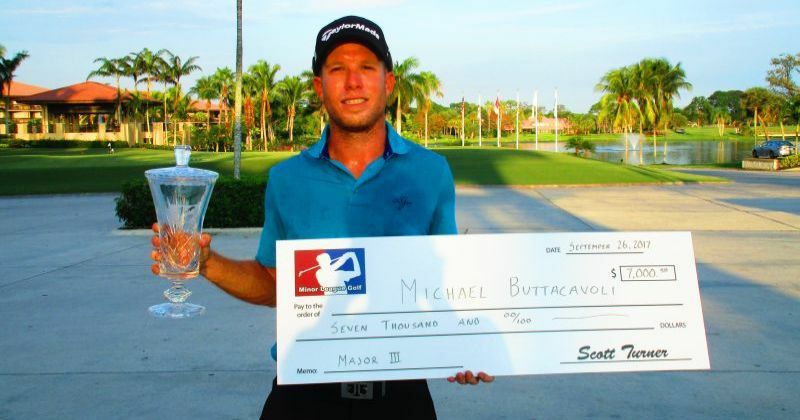 MONTEGO BAY, Jamaica - Michael Buttacavoli from Miami Beach, FL, won for the thrid time on the PGA Tour LatinoAmerica at the BMW Jamaica Classic. He fired rounds of 65-68-62 to take a three shot lead into the final round. Mother Nature didn't cooperate however and the final round was cancelled due to severe weather. His 21-under par total of 195 earned him the victory. Buttacavoli lives in Miami Beach and competes on the Minor League Golf Tour when he is home to keep his game sharp. He has won three times on the MLGT including 2017 Major III at PGA National Champion course and 2017 Qualifying School Contest #6. Michael currently has conditional Web.com Tour status but is hoping to improve his status as the year unfolds. Congratulations Michael and good luck the rest of the season chasing your full 2019 Web.com Tour card!